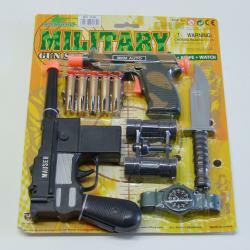 Main Category: Wholesale Toys & Novelties | Packaging: Blister | Hayes Specialties Corp.
Bring your commando dreams to life with the Combo Air Gun and Dart Set. Each case comes with a selection of 8 assorted with varying accessories. Not recommended for children under the age of 5. Bring your commando dreams to life with the Military Gun Set. It includes 2 pistols, darts for use with the pistol, knife, binoculars, and watch. Not recommended for children under the age of 6. 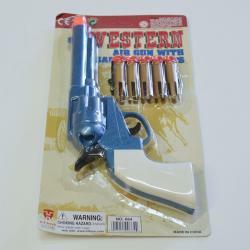 Let everyone know that there is a new sheriff in town when you use the Western Dart Gun Set. 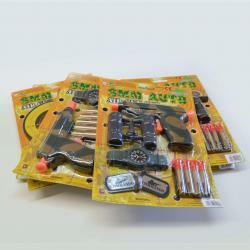 Each set includes an air gun with 5 darts for use with it. Not recommended for children under the age of 5.